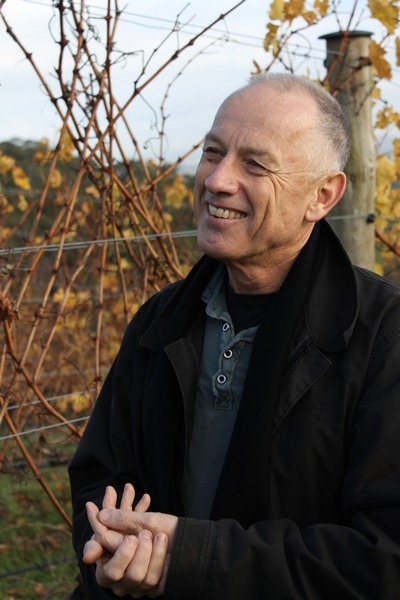 Those were words that a reviewer at one of the U.S. wine glossies told Aussie Yarra Valley producer’s Giant Steps head honcho Phil Sexton (according to Phil, anyway). To which Phil’s reaction was, apparently, something to the effect of “but that’s the whole point!” Linear acidity, mineral liveliness, longevity – those are clearly what Yarra Chardonnay and Pinot Noir are all about, if you taste enough of the stuff to be able to formulate an educated opinion on them. So Phil’s response to that unnamed critic was certainly more… diplomatic than mine would have been. 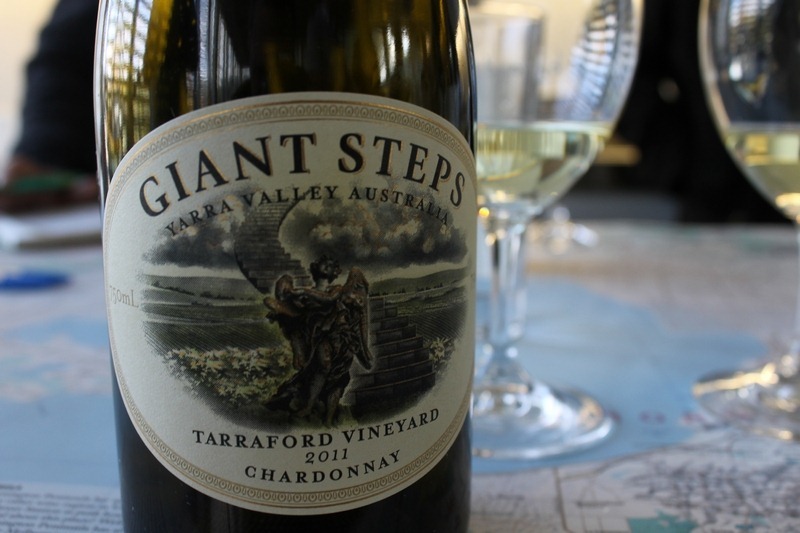 Intrepid 1WD readers will know that Giant Steps Chardonnay has done very well on the virtual pages here, so when I traveled to the Yarra Valley to visit Giant Steps (also purveyors of Innocent Bystander wines and Little Creatures beer, as well as a bistro in the Yarra). 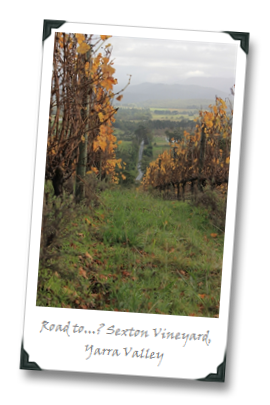 So I was pretty keen to see how Phil’s single-vineyard wines were doing in the U.S. market. 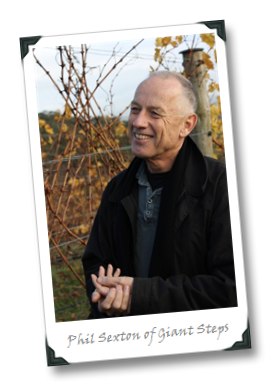 Giant Steps wines are made under the auspices of Steve Flamsteed and Sexton (the latter having planted one of their single-vineyard sources – the Sexton vineyard – by hand over a period of nearly three years). 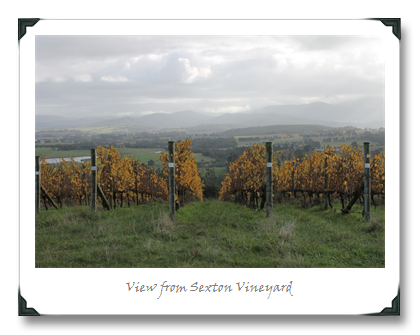 The vineyard locations, aside from their gorgeousness (and the fact that, in the case of the Sexton vineyard, they attracts small mobs of kangaroos regularly, which I’ll admit journalist types like me find cool), are what define Giant Steps’ single-vineyard wines. 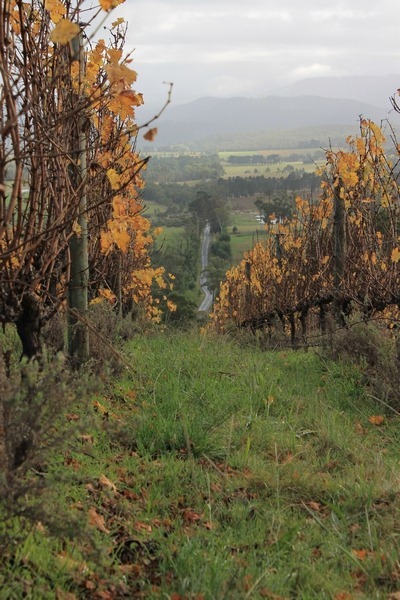 Those vineyards carry markers, thematic consistencies of linear structure, that cut through stylistic boundaries and are identifiable across vintages of GS wines. 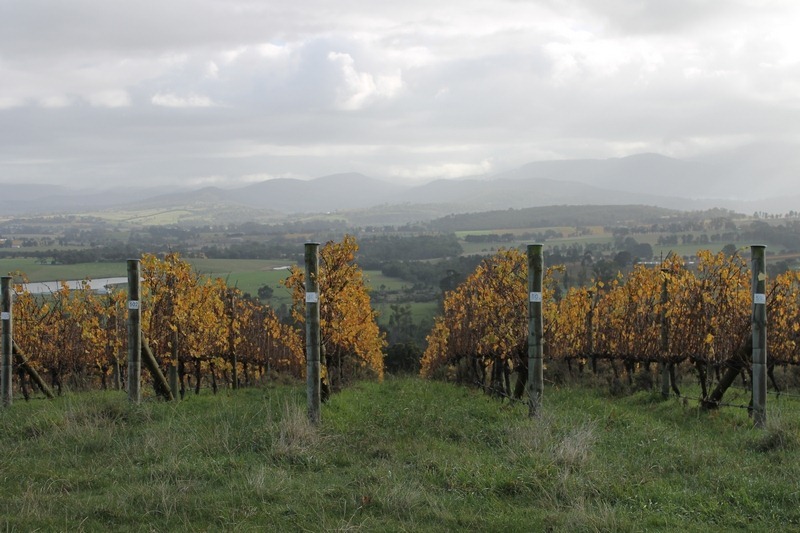 Which is all pretty clear once you’ve had an opportunity to go through a few of the recent vintages as I did when visiting the Yarra in May (as part of a whirlwind Wines of Australia tour of the country’s wine regions). That’s all assuming, of course, that you don’t dismiss these wines because they have linear structure, and can appreciate them for what they are – a skill that apparently some U.S. critics have yet to acquire. If that sounds preachy (which it does), imagine how most California winemakers would react to someone like me telling them that I couldn’t review their wines because they were too fruity. You’d need dental records to identify my body after that one. Giant Steps single-vineyard forays are most certainly funded by endeavors like Innocent Bystander, which are solid, capable and less complex wines that are more approachable when young. I dig those wines, but my heart and my head get a lot more wrapped up in the GS Chardonnays, particularly because they ought to be priced twice as much as they are, given their quality, verve, complexity and aging potential. This may or may not (but more likely, may) have something to do with the Yarra being a relatively cool-climate region, facing Antarctica (you can catch Sexton’s detailed view on how Yarra Valley’s location contributes to those fine wine qualities – and find out what pairs best with Wombat – by checking out my Wines.com video interview with him). The point is that these are wines of place, thoroughly under-priced (for the most part) and no one should be vilifying or ignoring them simply because one of their trademarks – one of the reasons to pick them up in the first place – is vibrant, structured acidic lift. They are worth pestering your local shops to stock them, so that we can get more of this vino in the States. Maybe glossy mag critic’s readers don’t want to hear about high-acid wines, but I’d say going into any tasting under that kind of assumption is doing nothing but selling a readership short. The purity of fruit is what first grabbed me about this wine: stone peach, lines, grapefruit. 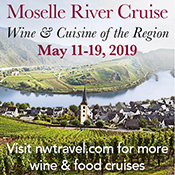 There are flowers and brioche, too, but what makes the wheels on this bus really go ‘round and ‘round is the minerality, which is clearly in the driver’s seat. 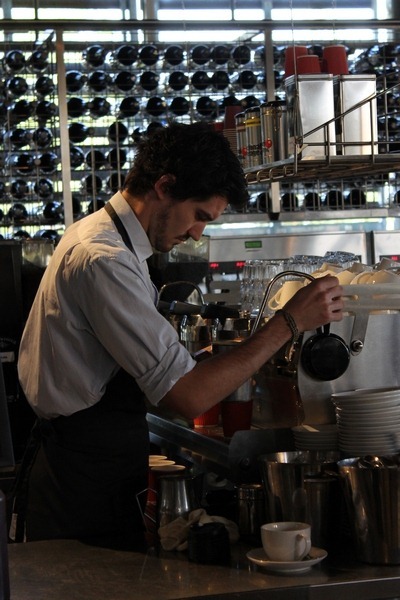 It finishes with elegance, a restrained texture and a kiss of cream. Not as stellar as previous vintages, but still a steal at the price. This is a toastier, more apple-dominated wine, but the floral hints are here as well, along with apricot and melon fruits. It’s vibrant as all get-out, as if he acidity had neon lights on it. Pretty, spicy, and earthy (even a touch animal); there’s a bastion of red berry fruit with a phalanx of dark cherries on the edges. The palate is the star of this show, though (which isn’t often the case for New World Pinot!) – it’s got red plums and a cherry finish that is practically dancing with more joy than a toddler bouncing to Yo Gabba Gabba. I am an acid freak. I love the way a wine with great acidity can elevate food. Tampa – thanks; I suppose I am, too… It’s tough because I also enjoy wines that some might consider almost flabby, so long as I think they are balanced and could find a food match. I mean, Douro still reds often have a ridiculously small amount of acidity to them and yet they can be so fresh and great with dinner. It really is a balancing act. I think the key is that no wine should be dismissed summarily (or simply) on the grounds that its main structural component is acid. Cheers! aren't all those snobby wine critic types all supposed to be acid heads? or am i confusing cool somms with bad print critics again? seriously tho Dude, you're on to something. why, just yesterday John Szabo MS said in #SommChat that if there was one wine from Canada that he could get everyone to drink more of, it would be the Chards (and there was some talk of Pinot Noir too!). conclusion? Cool-climate Chards are makin' a comeback y'all! @SirenaDiVino – I am starting to really dog those Pinots, actually! BTDubs, i really liked this article, so I went to go tweet it. I did it first by clicking the link at the top of the article, near the masthead (this link, actually "Hello fellow Twitterati! Please tweet this post if you like it"), which if course sent me to that third-party tweet posting site. all good and all, up until i realized that it also posted spam in my name on my facebook, which is not good. so i tweeted again using the tiny itty bitty button at the bottom on the article, and i'm MUCH happier with that one. just wanted to give you some feedback. Yikes! OK, will check that out, thanks! plus the tiny itty bitty button actually includes the title and text of your article, plus your twitter handle, where that big fancy link near the top only posted this to my twitter: "Reading: (insert random tiny anonymous link)"
Ok, changed teh greeting box code for ya so that won’t happen again! 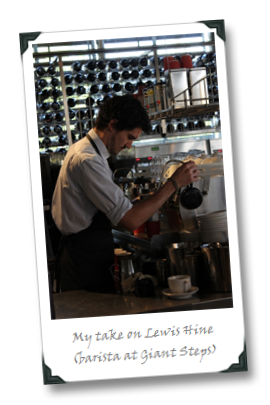 The button at the top in the header is for following the @1winedude twitter account, not for re-tweeting. Cheers! I'd rather put cigars out on my face than submit to any "professional critics". The shame is up and people are awake to their corporate wine agenda. Randy – I don’t blame you (and I say that as someone who is at least partially a critic!). I’m not saying that all critics have agendas (personally, I don’t) but I think time is much better spent for consumers in learning their own preferences and then (and ONLY then) following critics who seem to think and taste as they do. Cheers! 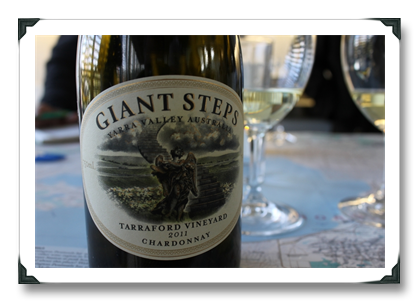 Wine Spectator gave outstanding ratings to Giant Steps 2010 Chardonnay (91 points) and Pinot Noir (90) in blind tastings, calling them "refreshing" and "graceful." Seems like this "glossy" likes these "high-acid" wines better than Joe does. Hi Thomas – No one said it was/wasn't WS, and I'm not mentioning the source because I didn't get clearance from Phil to do that. I'd say that your tasters liked them about the same as I do (maybe a touch less, actually, depending on which vineyard GS you're talking about there), unless you're talking about a different Joe? "Unless you're talking about a different Joe"
Funny how some people get so defensive. Does that mean they're guilty …..? ?